I enjoyed a week of holidays following the coast of 紀伊半島 (Kii peninsula, Japan) by train on 12-18 August 2004 to explore Japan, accompanied by 治子 (Haruko). We started in 伊勢志摩 (Ise-shima), visiting the two parts of the famous 伊勢神宮 (Ise shrine) and glancing at 夫婦岩 (Wedded Rocks) in the nearby 二見 (Futami). 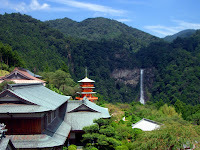 We then rode South, enjoying the beaches of 串本 (Kushimoto) on a sunny warm day, and walking the holy path of 熊野古道 (Kumano Kodo) to reach the impressive 那智滝 (Tachi waterfalls). For my birthday, I swam for the first time with dolphins in 太地 (Taiji) at ワールド・ドルフィンリゾート (World Dolphin Resort). We then rode North, breathing oceanic air at 三段壁 (3 Step Cliff) in 白浜 (Shirahama) and visiting the nearby 三段壁洞窟 (Sandanbeki cavern), which formerly sheltered pirates. During a short visit in 京都 (Kyoto), we watched the memorable 大文字 (Daimonji), Japanese characters burning at night in the mountains every year for 御盆 (Festival of the Dead). To finish our trip, we visited Himeji castle in 姫路 (Himeji) and small streets in 神戸 (Kobe).